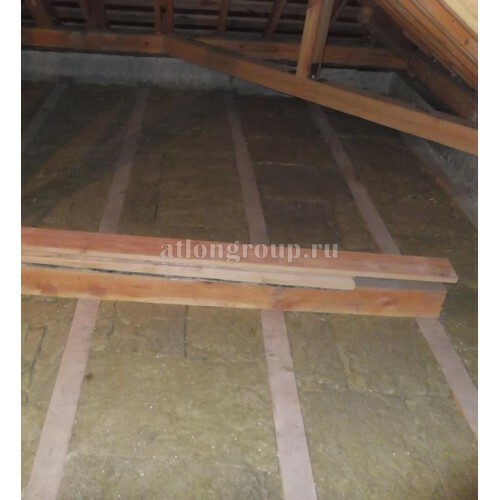 In the Urals, as in many regions of Russia, the traditional method of insulation of the upper floors is laying insulation in the attic. The advantage of this insulation is the full height of the ceilings of the upper floors and their area, long service life of wooden roof structures, additional sound and heat insulation formed by the roof itself. When properly insulated attic floor in winter snow on the roof does not melt, moisture and heat do not destroy the rafter system and the material of the roof. A common type of floor are reinforced concrete slabs and wooden beams. The latter due to the simplicity, reliability, low price and prevalence of wood used most often. Further we will tell about variants of warming of both types of overlappings by plates from expanded polystyrene and mineral wool plates. When calculating the distance between the beams, it is advisable to determine the type and format of the insulation, which will further avoid unnecessary cuts and overspending of materials. Certainly, calculation of section and length of beams, as well as a step between beams, it is necessary to conduct taking into account all distances and loadings. We offer basalt slabs have the following format: 1000х500х50мм, 1000х600х50мм, 1000х500х100мм, 1000х600х100мм. Polystyrene plates following formats (foam, EPS, PPS): 2000х1000мм, 1000х1000мм, 800х1000мм, 600х1000мм, 500х1000мм. The thickness of the plates will fulfill Your order from 20mm (2cm) to 300mm (30cm) or more. "Running" thickness 50mm, 100mm, 150mm, 200mm. Extruded polystyrene of the proposed format 1180х580х30мм, 1180х580х50мм, 1180х580х100мм. This type of polystyrene foam should contain flame retardants (substances that prevent burning), the group G3. Since lumber is often taken for the installation of natural moisture, we recommend to treat the beams with reliable compositions for protection against pests, mold and fires (antiseptics and flame retardants). The ends of beams are usually treated with bituminous compositions and wrapped with roll waterproofing. A prerequisite for the use of mineral wool insulation is the use of vapor barrier membranes (films). The flow of warm, moist air tend upwards of a building and should be directed to the exhaust ducts of ventilation. Without the use of protective films moisture enters the insulation, and it loses its properties. Installation of films should be carried out according to all rules, securely protect the insulation. The density of mineral wool plates is better to choose from 30 or more kg/m3 (grade P35, P40, P45,P50, P60). Soft roll insulation density up to 15 kg / m3 is ineffective, as the insulation is not the material itself, and the air mass in the immovable state, which is achieved at a low density of fibers such insulation is not possible. The thickness of the insulation 150-300mm. Styrofoam plates (foam, EPS, PPS) are lightweight, easy to cut, can carry heavy loads. At not high cost are very effective material for insulation of attic floor. 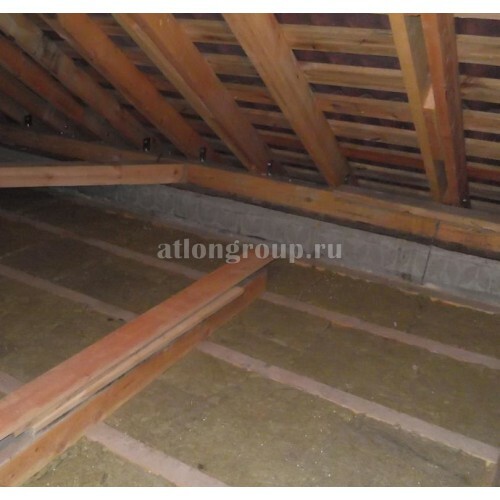 For insulation of the attic, we recommend you to select the brand of PPS 12 GOST 15588-2014, PPS 13 GOST 15588-2014, PPS 14 GOST 15588-2014, faculty 15 of TU. The use of films for vapor barrier is not necessary, as polystyrene does not accumulate moisture in any significant volume, while conducting moisture through itself, but in a small amount. Plate to lay extension (moving the joints), gaining two thicknesses. It is possible to combine polyfoam with basalt mineral wool plates. To do this, you need to sewn on the bottom of the beams boards or plywood (or other) to lay the foam plates, foam fill the joints and cracks, trim the excess frozen foam, lay the next layer of foam plates on the same technology, then spread the basalt plates to the edges of the height of the beam. For the convenience of further movement in the attic, you can lay a floor Board or plywood. Plywood in this example is shown as a thin, lightweight, durable, durable material to which it is easy to attach any construction screws (eg frame suspended ceiling). For insulation of the attic on the reinforced concrete slabs it is desirable to choose insulating materials with higher density. As a rule, walking on such a technical floor is inevitable (inspection of communications, roof maintenance, etc. ), so you need to provide a "track", or make a screed on top of the insulation. The task-not to damage the insulation when walking. You can lay sheets of asbestos cement (flat slate) or make a concrete reinforced screed. 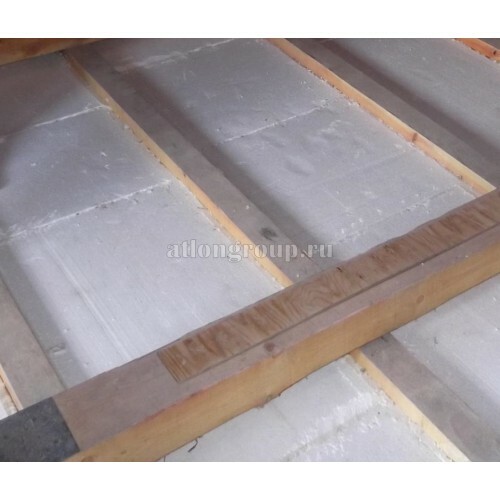 We recommend to insulate in this case mineral wool boards with density of 110-200kg / m3, plates of expanded polystyrene of PPS 17, PPS 20, and also extrusion expanded polystyrene of the XPS 30-35 brands. It should be noted that under mineral wool plates it is necessary to spread out a vapor barrier (application of a dense polyethylene film is possible). Refer to our experts for advice and choose your own version of the attic insulation. Get insulation on the object, enjoy the warmth and comfort in your own home! Repair of jackhammer Makita in Yekaterinburg.. The price of a meter of foam varies and depends primarily on the brand. If you take the cost of a me..
Buy polystyrene foam insulation can be very simple: select the brand and size, make an order by clic.. Foam of various thickness with the prices for sheet is presented at us. Not all options are presente.. The price of foam 5 cm, 10 cm, 15 cm of different formats listed on our website. The cost of foam sh.. Foam 10 cm with an attractive price in our company. This brand is able to transfer pressure up to 10..
Sale of sheets of foam plastic and expanded polystyrene 150 mm thick in Yekaterinburg from the produ..